The Lord has bless St. Mary with a man with a vision! ...and God has bless Pastor D.E. Sandes Sr.
Reverend Dwayne E. Sanders Sr. is the third child of the late William and savior Henrietta Sanders. He was born in San Antonio, Texas at Lackland Air Force Base. Later relocating to Tampa Florida in a growing community called Progress Village. Where he and his siblings of two brothers and two sisters were raised. 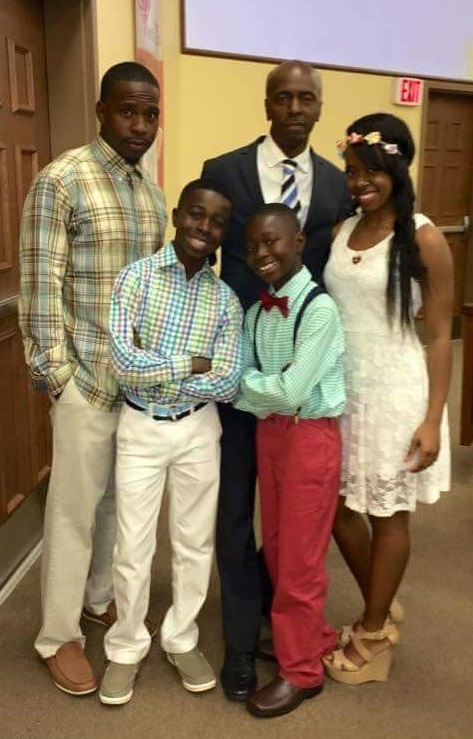 Reverend Sanders value his family traditions; he appreciates the love and support of family. Reverend Sanders graduated from Brandon High School and attended Hillsborough Community College seeking a degree in Secondary Education. He believes in higher education, where he attended Florida Baptist School for his Pastoral Studies degree. Dwayne Sanders is a visionary his future plans are returning to College in Secondary Education and to continue seeking his Degree in Pastoral Studies. His favorite scripture is Isaiah 40:31, but they that wait on the LORD shall renew their strength; they shall walk and not faint. Reverend Dwayne Sanders accept the call into Ministry back in May of 1991. He was licensed and ordained for Pastoral Ministry, June 1, 1992 at First Baptist Church of Progress Village by Dr. Roosevelt Robinson Jr. Sanders counsel in the ministry with Sunday School, as Youth Discovery Director, Youth Mass Choir and Adult Choir Director. And is serving till this day as Associate Pastor to the first family and assistant to Dr. Samuel Maxwell Senior-Teaching Pastor, Worship Leader, Praise Team, Male Chorus Director, continuing as Sunday School Teacher, Youth Discovery Teacher, and former Singles Ministry Director. Dwayne Sanders has a strong desire for music but his passion is preaching and teaching the word of God. His strong will to mentor the youth, he believes they are our future. His purposeful quote is Believe in your-self regardless of what others may say there are no bad children, they just make bad decision and for the youth at heart, be the model for your children to follow. Reverend Sanders is an active participate for his community, where he is a vigorous supporter with the Progress Village Panthers as former Athletic Director for football and cheerleaders, offensive coordinator for peewee panthers . He is also a supporter of Progress Village Little League and the founder of “-D.I. A”, Dads in Action Club.